A husband-and-wife team is celebrating a successful first year in business at a popular village pub. Chef Paul Bussey, who once worked for acclaimed TV chef Gordon Ramsay, left his role as head chef at Acklam Hall in Middlesbrough to take on the King’s Arms in Great Stainton, on the outskirts of Newton Aycliffe, in August 2017. And with his wife Ycheng heading up the team’s front-of-house staff, the pair have enjoyed a fruitful opening 12 months. The King’s Arms re-opened a year ago after an extensive refurbishment following a lengthy closure. Twelve months on and it now employs 15 staff – including Nepalese sous chef Bhakta Thapa, chef de partie Sylvester Scallon and trainee chef James Lapping – and is winning rave reviews for its evening meals and weekend lunches. “It’s going well – we get a lot of good positive feedback,” said the 33-year-old. “It’s difficult for restaurants to make a profit in its first year, but we’re delighted with how it has gone. “You need to get to a certain level and then stay consistent – because as soon as you lose consistency, you lose your customers. “But we’re getting a lot of repeat custom and lots of regulars, and we get great feedback on our food and service. 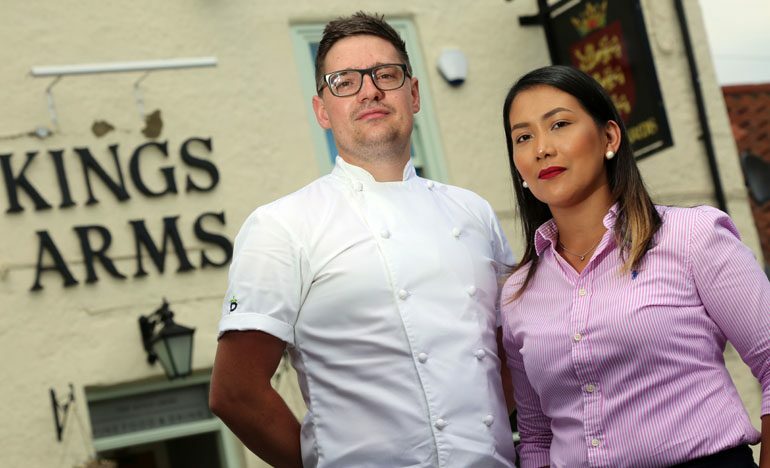 Paul and Ycheng, 34, are making a success of the King’s Arms despite juggling a busy family life. The couple, who married five years ago, have two children – Ethan, 7, and Isla, 4. But they say their success is largely down to using local suppliers. “We try to use as much seasonal produce as we can with fresh ingredients and we have a good relationship with the local farmers,” added Paul. “We get all our meat from local suppliers – we have a farmers’ night every Thursday – and we get our fish from Hartlepool. Paul was just 18 when he left the North-East for London to work at The Connaught under the guidance of Angela Hartnett, a protégée of TV chef Gordon Ramsay. Later he worked for Mark Broadbent, who won accolades during a stint on The Great British Menu. Then came more experience at The Star Inn at Harome before a spell as a sous-chef in Ramsay’s restaurant in the Hilton Dubai. Paul was previously head chef at the highly-acclaimed Cleveland Tontine before he joined Acklam Hall. The King’s Arms is now serving lunches 12-3pm Mon-Sat as well as Afternoon Tea 12-5pm Mon-Sat, and evening dinner 5.30-9.30pm Mon-Sat, with Sunday lunches served 12-6pm. They’re also holding a Birthday BBQ celebration on Sunday August 27, 12-6pm. • You can find the King’s Arms on Facebook and Twitter, or to reserve a table call 01740 630873.